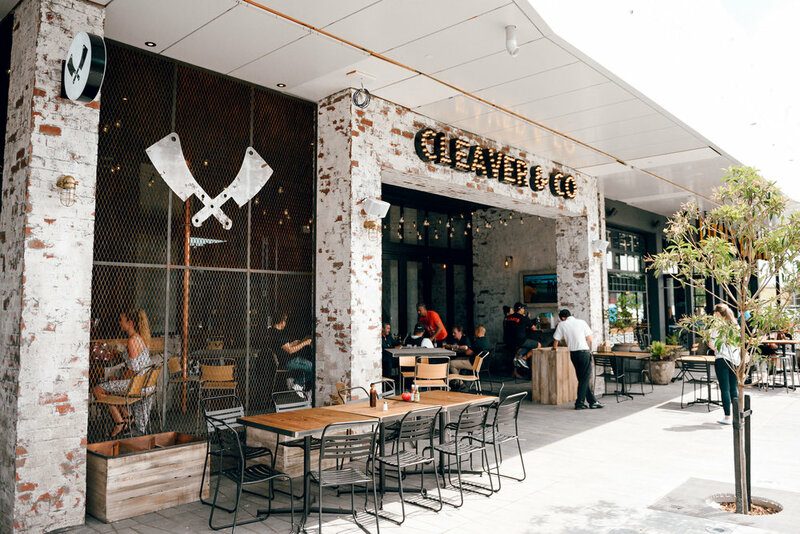 Located in the bustling Brickworks development within Auckland’s New Lynn mall, Cleaver & Co needed to entice diners in order to compete with half a dozen other neighbouring dining establishments. Cleaver & Co is one of a series of dining establishments that Ignite’s specialist hospitality team has designed for client Lion – Beer, Spirits, Wine Ltd. Set on a corner site on the Brickworks ‘lane’ within Auckland’s New Lynn mall, it offers slow cooked smoked BBQ-style meat in a smart but relaxed setting, with a highly social atmosphere. Cleaver & Co celebrates the art of slow cooked, smoked meat. To ensure the product remained the hero and gave the restaurant a competitive edge, the design of the space centres on the wood-fired smoker and BBQ pit master. Throughout the space, references to meat and butchery reinforce the fact that Cleaver & Co is made for meat-lovers. Despite occupying a brand new site, the Cleaver & Co’s design makes it seem as if the restaurant is located within a much older building that has a previous history of industrial use. The intentionally ‘aged’ effect references a traditional butchery of days gone by, and is in keeping with the Cleaver & Co brand story. The traditional butchery theme is emphasised through the use of details, such as meat hooks over the bar area. A large, glazed garage door opens out to the exterior seating area, and reinforces the sense of a warehouse-type building. The story of Cleaver & Co and the art of smoked meat cooking is told using a large, chalkboard-style graphic over the kitchen servery. Wooden chopping blocks, faux leather booth seats and oxblood coloured marble with the texture of meat are intended to celebrate the restaurant’s hero ingredient. While the exterior of the restaurant has a fresh, contemporary look, its ‘aged’ interior was achieved through the clever layering of building materials and use of effects such as textured brick, aged plaster and timber with blackened steel strapping wall features.